Well, it is ridiculous for now, but the framework is almost ready, so we need only behaviour/appearance improvements. Start it from: "project|Source debugger". I need some tests on different plathforms, because there probably will be problems on NT/2000/XP machines. Better test it with simple.asm or test.fpr from directory "examples". Important (help needed): Now, after finishing debugging session, the debugged program terminates normally, but the exe file remains locked for write, so second compilation is impossible. It is unlocked only after closing Fresh. I close all handles to the threads and processes, but it not help at all. If someone know some solution to this problem, please, post some info. Another useful feature is "Project|Goto address". It possitions the source editor on the line with given address. Great for working with external debuger. But it uses the same engine as debugger, so the similar problems may occur. This function needs compiling before it can find the line. Please, provide feedback. It is important for future developement. Well I must say I'm impressed . Debugger seems to fork fine in WinME. 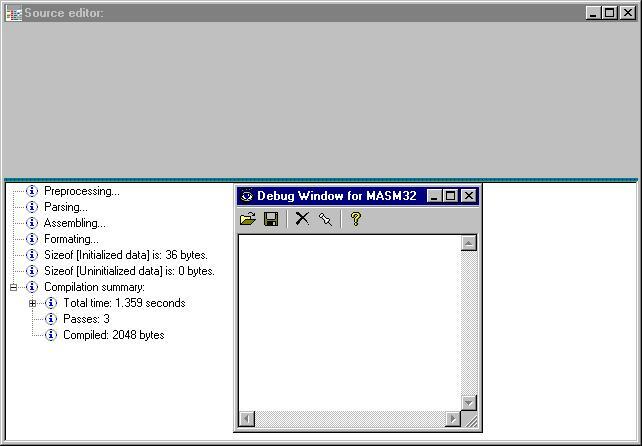 However, the package contains an executable, but it is older, so to see how does debugger work you have to recompile Fresh. However, the package contains an executable, but it is older, so to see how does debugger work you have to recompile Fresh. Sorry for that, I forget to change the executable. But I will leave it this way, because I will upload better version very soon. I only wait for some XP reports to be sure that it works under XP. I will test at home later. It doesn't work properly on WinXP. It puts only the first character. Well, I know that there is some bugs in WinXP and I am working on them, but what about debugger function? When you load (for example) the file: simple.asm and press Shift+F8, Fresh should compile the program, run it in debug mode and stop on the first instruction of the source, showing the message box with title: "Single step". Then on every [OK] it should step instruction by instruction to the end of the source. After Shift+F8, compilation is OK, but something is missing according to your explanation. I am currently studying your code to try to give some help with xp. When the program (testProj) compiles, it stops in the first line and then it runs until the end without the stop. The problem is probably with "WaitForDebugEvent" or "ContinueDebugEvent" now I am preparing an old computer with win98 to do a parallel to try to get where's the difference. p.s. I am puzzled about the editor bug. Sometimes I don't get the characters painted nor selectable. I am almost ready with next work version with a lot better user interface for debugger. I made big changes in the layout making some kind of debug "server" in separate thread. Maybe it will make things better in XP. Anyway you help will be great, because I have no XP and I don't want to install one on my old computer. I just uploaded new work version of Fresh with the second atempt for debugger. It is almost fully rewriten, so, now it have almost real "debugger" user interface. I tested it on my Win98. Any help on debuging/fixing on WinXP is highly appreciated. Why there are two breakpoints while the code contains only one? And after int3 it just "jumps" over the nop instruction. New work version uploaded on the Fresh site. ( http://fresh.flatassembler.net ). Well after some remote debugging, Me and Tommy fix the bug in Fresh debugger related to Win2000/XP. (Tommy was remote server, I was a client. ) Now debugger should work. At least Tommy didn't provide bugreports anymore. Also, user interface for debbuger is changerd. Please, send feedback. There are probably another bugs. Sorry my friend, here it isn't working but I like it very much the new appearance and interface. 3. The highlighting have some problems. There are a bug on stop button. I clicked it by accident and fresh crashes (cpu get's 100%). Thank you for the help. I think to stop debugging debugger, because I still have no WinXP. So, any help with any speed from you is great. I will check some another features these days and I have to finish code completition. btw, CC list opens when you press '>' also. I think I realize what is the problem on XP. It seems to be because of data missalignments. I post here the current exe. It work on one Win2000 computer. I hope it will work under WinXP too. Please someone to test it. btw: Strange, but the debugger works very slow for me on Win2000. Look at the Fresh site for the latest version. BTW: I noticed that when a DLL is loaded the only message that appears is "DLL loaded: "... Is this a bug, or haven't you implemented it fully yet?